A 2nd revision post, topic picked at random, for the BBKA’s Module 2 exam, ‘Honeybee products and forage‘ in November. I know the diagram below is no great work of art, but research evidence suggests writing things down helps commit them to memory. One study found that students who physically write notes at a lecture will do better at remembering them afterwards than students who type their notes on a laptop (see ‘Take notes by hand for better long-term comprehension‘). So I like to write and colour in the old-fashioned way. Apple is a nice simple flower to study. The stamen and anthers providing the pollen are the male part of the flower. The stigma, style and ovary are female parts. Bees collect pollen as they enter the flower and are also attracted to apple flowers by nectaries at the base of the flowers. As a bee drinks from the nectaries, her body brushes against the anthers and her hairs pick up pollen. When the bee moves on to another flower belonging to the same plant species, the pollen attached to the hairs on her body rubs off onto the stigma and fertilises the flower. The pollen germinates on the sigma and its pollen tube grows down the style to the ovary. 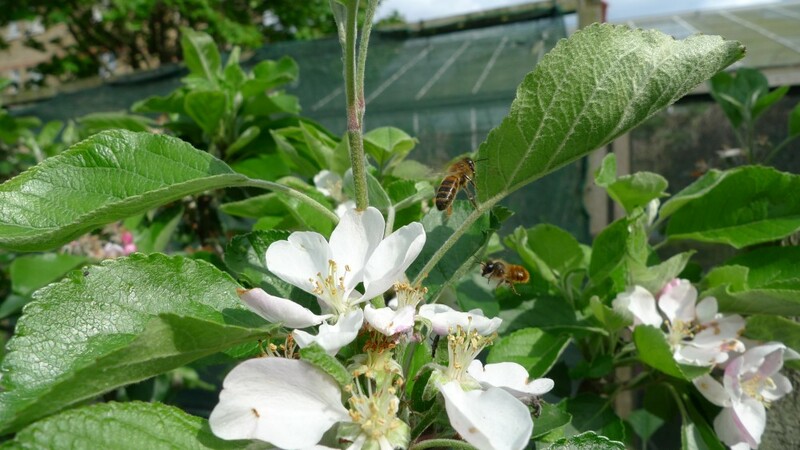 When it comes to pollination, unlike some other fruit trees apples are self-incompatible. So to develop fruit, apple trees must be cross-pollinated. This means that the flowers have received pollen from a flower on a different apple tree (rather than a flower on their own tree). I was interested to read that a single honeybee forager can carry up to 40 mg in her honey stomach; a apple flower typically produces 2 mg of nectar per day. The flower does not release 2 mg of nectar all at once, but only a small percentage of that amount. So a forager needs to visit many more than twenty apple flowers to fill up her honey stomach. It’s been estimated that a single bee can visit up to 3,000 flowers in one day (The Buzz about Bees, Jürgen Tautz). Once pollinated, the flower will stop producing nectar as it no longer needs to attract pollinators. Some flowers can also indicate visually to bees that they have been pollinated and their nectaries are empty. Hopefully I’ll get time to write about this in another post. This entry was posted in Exams and tagged Module 2, pollination. Bookmark the permalink. I love your illustration! I believe you that taking notes by hand leads to better comprehension. Slowing down, getting emotionally involved and using multiple senses are all good strategies for retention. I’m starting to find nectaries interesting too, and am hoping to do more posts on them if I get time. There are also ‘extra floral nectaries’, which are located on parts of the plants other than the flower. I find it fascinating that some flowers offer bees warm nectar, which bees prefer as it’s is extra helpful for maintaining their energy. The relation ship between plants and bees is fascinating. Nice one! Lovely diagram – takes me back to biology at school. And you are right, writing it down – or even better drawing and labelling it – are great ways to remember. Have you ever tried using mind mapping as well? Thank you 🙂 I’ve not tried mind mapping very much. Do you use it a lot? I like the stylish way you described the stigma. Thank you. I see the stigma as a fashionable lady doing a yawn with her arms in the air, very elegantly. 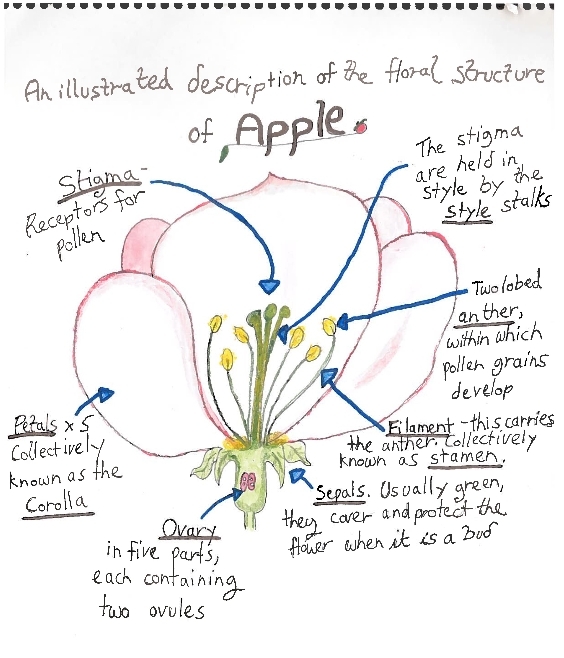 I very much like your diagram of the apple flower: it’s both very informative and very attractive! That means a lot Philip, thanks!